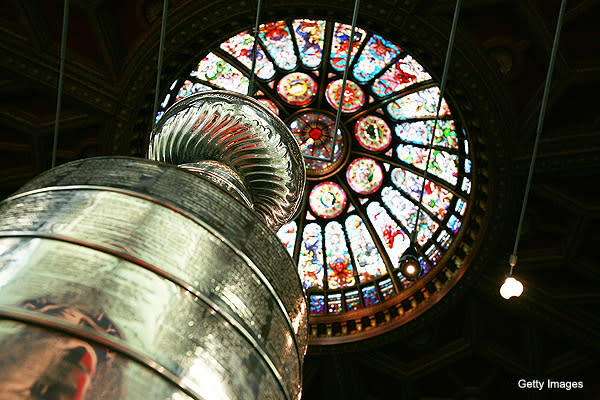 TORONTO - Beneath the stained glass of the Hockey Hall of Fame's Great Hall, four discussion panels followed a beer-and-mini-crab-cakes hour under the guise of the "World Hockey Summit." After listening intently for a few hours, we can only assume they chose that moniker because of the fact that "MONEY, AND HOW IT CONTROLS EVERY ASPECT OF THE PRESENT AND FUTURE OF HOCKEY" made for a more confusing acronym. Money for the transfer of players between Leagues, and Leagues trying to maximize the money they receive for international play. Money negotiated and then taken by agents, and the 14-year-old players who are eager to share their future money with those agents. Money for rinks, for larger ice, for equipment in impoverished regions. Money to bring us together, money to tear us apart. All of it in front of "delegates" who paid $450 of their money to attend the 4-day summit so they can hear about money; and, in one of the evening's most genuine moments, a brief live commercial promoting the Hall of Fame's new gift shop, where you can spend your money to buy gear for defunct teams that ran out of money. This is, perhaps, a too-cynical read on the Summit's opening night. It's not as if good hockey men like Steve Yzerman and Brian Burke and Bob McKenzie were obsessed with putting capitalism and profit over love of The Game. But it's the reality of our surroundings: Nearly every topic covered on the "Hot Stove" panels, and scheduled for the rest of the week, is affected by financial considerations or restrictions. I believe it was the philosopher known as P. Diddy who said it best: "Uhh, uh-huh, yeah ... It's all about the Benjamins baby." 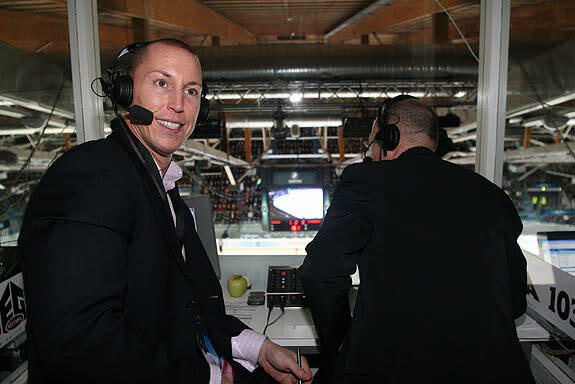 Coming up, the top 10 moments, personalities, trends, and complaints about the 2010 World Hockey Summit after Day 1. I don't want to spend too much time bitching about the format of the opening night panels, because it's a bit like reviewing the movie you had in your head rather than what's on the screen. But the lack of debate, interaction and constructive dialogue on the panels didn't make for a compelling evening. They were talking at us, not with each other; those hoping for tense or revealing moments had to wait until Slava Fetisov would instigate a smirk from NHL deputy commissioner Bill Daly during a pro-KHL soliloquy. Fesitov talked too long and muddled his topics, but as chair of the KHL's board of directors he also served as a lone contrarian voice at the summit on his panel about contracts and transfer agreements. To put it in geek terms: He was the Klingon at the captain's table on the Enterprise. What was surprising from Fetisov, with KHL President Alexander Medvedev in the crowd: Candor about a better working relationship with the NHL. Of course, this is a relationship the KHL needs more than the NHL, because Russian officials are inevitably seeking "fair value" for the transfer of star players like Alex Ovechkin(notes) rather than a flat rate for all players leaving for North America. "We're not Soviet Union anymore. We invest in our hockey program in different ways," Fetisov said, in the hall where his image is proudly displayed as a hockey immortal. "We need to get the world market relationship between the two leagues for the transfer of players. " "Parents are the worst judges of talent that ever walked the planet. They're just not rationale about [their] own kids. You mean well. You love them. But the fact is that you've got a warped prism in looking at that kid, and you're never going to lose that perspective," said Brian Burke during his panel on player agents. "If you think your kid needs an agent at 14 [years old], you're probably wrong." It was interesting to hear some criticism of the NHL's Premiere Series -- its opening games in Europe -- from panelists like Daniel Alfredsson(notes) and former NHLPA official and NHL goalie Glenn Healy, who candidly deemed the experiment as unsuccessful. "I certainly don't believe that's been the case to date," said Bill Daly. "Certainly over time, as we expand the number of teams that are going over there and we go over there more often, I would think that the sophisticated European audiences will want to see our best teams and our best players." Daly said the teams that have been chosen to date have had several player-specific ties to certain countries, like Zdeno Chara's(notes) Boston Bruins playing in Prague, for example. But there NHL teams with undeniable international brands, and those are the teams the fans in Europe want to see, something Daly said the NHL would "monitor" going forward. The Champions' League concept, based on the highly successful tournament now used to crown the European club champion in soccer, was a far more nebulous prospect for the panel. It was hard for any on the panel to imagine a future in which the top teams from the NHL would face the champions of the various European domestic leagues in a winner-take-all tournament to determine the best club team -- as opposed to national team -- in the world. Alfredsson would love to see European clubs go toe-to-toe with NHL clubs to determine the best team, but it has to be in the proper format. "It has to be meaningful," Alfredsson said. "It can't be one game before the season starts. It has to be a tournament that means something. If it is, it will definitely help the game and it is something to strive for." Interesting idea, fan-friendly concept ... but what, exactly, would the NHL gain from having the reigning Stanley Cup champions trounced by, say, a Finnish League team in a Champions tournament? There are certain topics this Summit needed a better focus on, and the way the game is presented via electronic media would have been a really interesting one to tackle. Uwe Krupp and Steve Yzerman both said they got into hockey by watching it on television; that's a story shared by millions of fans and players, and one that's transformed into "I like hockey because of [insert name of video game]" for subsequent generations. Plus, the varying degrees of hockey's access to television viewers around the world would have been enlightening. Krupp said HDTV hockey is only available on a subscription basis in Germany; how do other nations watch and consume the game? Granted, there are certain topics that play on a micro level than as a "World" issue, and NCAA hockey talk is an example of that. Still, to hear Brian Burke blast college hockey's hypocritical rules about agents vs. "family advisors" made one want to listen to more chatter on the topic. "The NCAA rules are frankly a sham," said Burke. "The family advisor that I talk to looks a the same agent I deal with for a player on my team." Bill Daly cleared up a misconception about Cristobal Huet's(notes) potential loan to a Swiss team: He'll effectively have "two contracts," but that it's a "typical situation." The Chicago Blackhawks and the European club can then come together on contract terms. Unfortunately, no follow-ups on how in the world this practice can't be viewed as cap circumvention. There is going to be a lot of discussion during the week about the women's game and how to bring more international players into it. But in thinking about participation numbers for men's and women's hockey around the world, one always revisits two constants: economics and cultural biases. The former was discussed in nearly every panel; the latter wasn't touched, and the lack of panelists of color on the panels in what purports to be about hockey's place in the world was disappointing. Finally, we don't know if it was incredibly appropriate or oddly distracting to have trays of Molson beer filtering out into the crowd during the panel discussions. It actually makes us even more annoyed that the panels weren't as explosive or compelling as we had hoped. 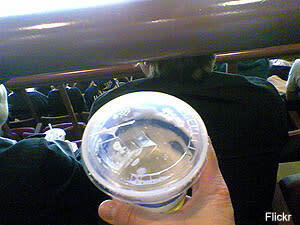 What's a cheap cup of a beer at a hockey event if there isn't a reason to throw it in protest or celebration?